RIGHT smack in the hustle and bustle of Kuala Lumpur’s city centre is a cozy little Japanese restaurant called Doraku. Originating from the first Doraku restaurant in South Beach, Florida in the United States, this authentic sushi bar is like no other. Doraku combines traditional Japanese cooking with innovative South American and Pan Asian flavours. Doraku boasts branches in Miami Beach and Waikiki, Hawaii in the United States and most recently, opened its first Asian outpost at Kuala Lumpur’s Life Centre. Founded by Kevin Aoki, a scion of the Benihana restaurant empire, Doraku offers audacious cuisine that will tantalise your taste buds as well as entertain you with their modern interior and lively music. 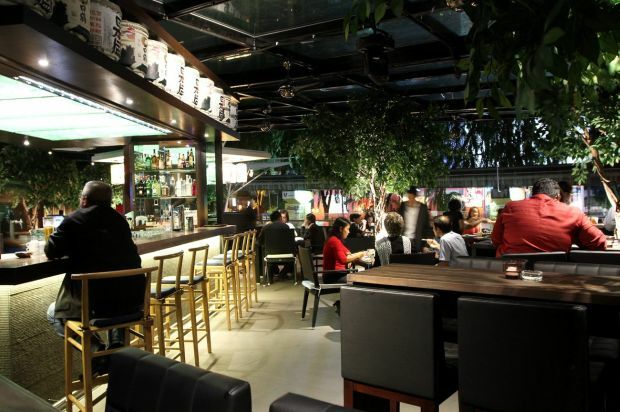 “Most Japanese restaurants have a quiet and calm interior,” says Aoki. “But we thrive to be different, hence our lively music and dazzling interior lights. It’s a modern twist on an authentic Japanese sushi bar. The people at Doraku build their menu based on appreciation, importance of hospitality, fresh ingredients and attention to details. And as such, Doraku only uses the freshest fish from both local and global markets. The fish is then packed in ice and flown in daily to the restaurants. Using imaginative techniques, the chefs draw out the distinct flavours of the fish through sauces that have been passed down through generations. If you’ve never been a fan of Japanese food, especially when it comes to sushi, Doraku might just be the first place to break that pattern. Introduce your taste buds to the exotic flavours Doraku has to offer, and you may not think twice again about sushi anymore. The Sweet Philly Rolls would be the best dish to experiment with if you are not very adventurous with Japanese food. This crunchy sweet roll made from sweet potato and fish stuffing has a very light fishy taste to it. It’s best consumed whole and leaves you wanting more. However if you’re ready to be more adventurous, then you’ll have to try the Salmon Carpaccio. Fresh salmon served on a bed of tasty sauce, seaweed in the middle with a tiny dollop of mayonnaise, this meaty dish is tender and delicious. The Japanese Beef Ribs is another must try on the menu. While it isn’t quite Japanese, the sweet, spicy and succulent meat is cooked to perfection – one bite into it will satisfy your red meat cravings in no time. To wash all the delicious goodness down, some of the famous beverages available are the very traditional Asian Mojito, which includes all the perfect ingredients for a refreshing alcoholic beverage such as mint leaves and lime. The Ume Margarita may sound like a typical margarita drink. But instead of salt, the rims are coated with asam boi. It gives a great kick to the drink and is very tasty. 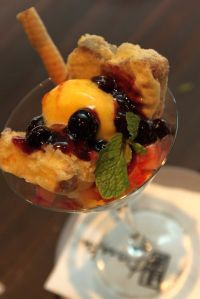 On the dessert list are some must-tries such as the Brownie Tempura Ice, which comes with vanilla ice cream and the Assorted Cherry Fruit Cake. It truly is never a dull moment at Doraku. Discover the adventurous foodie in you and bring the clan along for a gastronomical delight.